Nearly everything that gets accomplished in this knowledge economy has a team behind it. The more cohesive and collaborative that team is, the better the results. First and most important, everyone on the team understands their purpose, buys into the vision, and acknowledges the need to collaborate. They have constructive debates and work through differences of opinion, because they’ve agreed on how to do that. They trust each other to attack the problem, not the individual. Since more ideas are put on the table, they arrive at more innovative solutions. 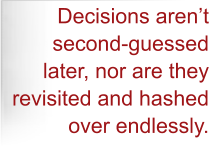 Decisions aren’t second-guessed later, nor are they revisited and hashed over endlessly, saving time and energy for successful implementation. People who are rewarded solely by hitting their individual performance objectives are not highly motivated to work with others for the collective good. It’s common sense. Incentives help, but they’re not enough. Without a compelling purpose, people will go through the motions of working together, grumbling about how much time they’re wasting. Even if they have good intentions, without a structure, rules of engagement and an accountability process, they’ll flounder. So when a team runs into an obstacle, people tend to make excuses, point the finger or mentally check out, rather than work together on a fix. Tension builds and trust erodes, taking things in the wrong direction. Creating the conditions for trust and behavioral change requires skill and finesse. It’s a rare leader who can both participate in a discussion and observe and respond to the dynamics of a group. 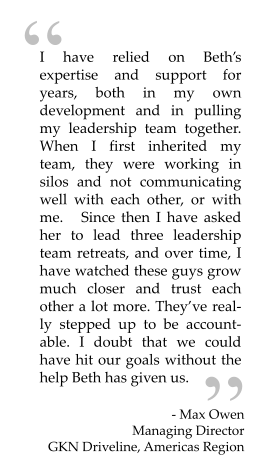 You have to be careful not to unduly influence the outcomes, and at the same time read what’s going on in the room, listen to what’s not being said, redirect or reframe conversations, rein some people in to draw others out, constructively call the team out on unproductive behavior, and stay focused on the objectives. To attempt to facilitate a team collaboration process yourself puts both your team’s potential and your credibility at risk. 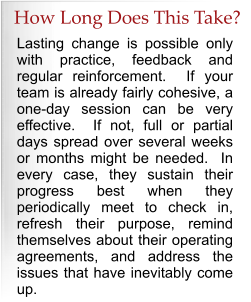 Moving a team from even slight dysfunction to a sustainable state of willing collaboration takes time. It can be messy and feel cumbersome and inefficient. When a team jumps into it, their expectations can be unrealistic. They need structure and support to make the transformation possible. When coaching a team, I start by creating a safe environment where members are less cautious about expressing their opinions. Then they get clear on what they need to accomplish, how it fits into the big picture, and why they absolutely have to work together to pull it off. 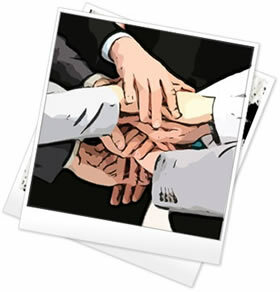 They work on how to achieve their goals, and at the same time, learn and practice collaboration. I encourage debates that are both robust and respectful so they learn how to have conflict without causing damage. I challenge and stretch them beyond their usual boundaries, but not over their edges. I keep them moving forward by calling out what I see, particularly elephants in the room. I ask the team to decide who will be accountable for which results and how they’ll check in on progress and help each other out. Throughout the process, I point out successes and help them learn from setbacks. As the leader, you’re in the spotlight. Your ability to set expectations and be the example of collaboration will be critical to transforming your team to a highly functioning one. The temptations and need for restraint are many. Depending on your leadership style, there may be times when you’ve had it with the discussions and you just want to get on with it and drive to a decision. Or you might be uncomfortable with what looks like dangerous conflict and try to quell passionate debates. And unless you’ve mastered the art of patient, non-judgmental listening, you can unintentionally shut things down. This team coaching process will help you recognize these natural tendencies and replace them with authentic, collaborative leadership behavior. In other words, you’ll grow along with your team.